Application of System of Rice Intensification concepts and methods to the growing of finger millet, known in much of India as ragi, was one of the first extensions of SRI thinking, starting in India, but then also undertaken in Ethiopia. 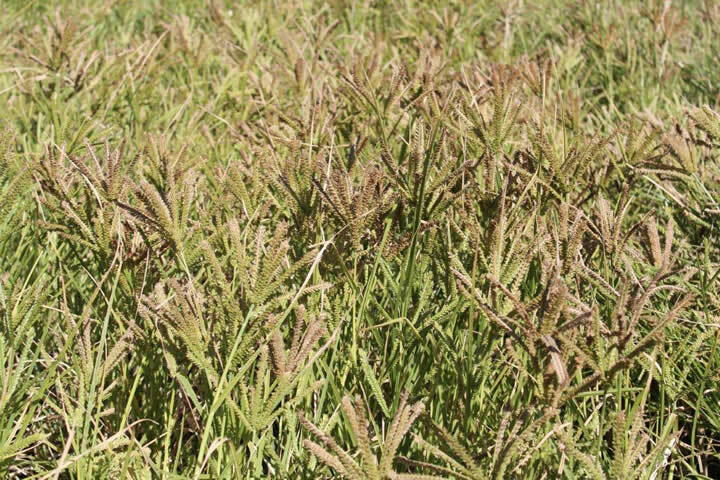 Finger millet is a major cereal crop for the poor in both South Asia and Sub-Saharan Africa. (Unfortunately, there have not been SRI adaptations tried much with sorghum, a close relative of millet, but this is now starting in Ethiopia.) Ragi has been cultivated in India, and especially in the south Indian state of Karnataka, for thousands of years. However, over the last three decades, this crop has been in decline according to an article in InfoChange. The low price of ragi in the market has reportedly forced farmers to shift to cash crop cultivation and the trend is towards growing cash crops rather than ensuring your own food security. This has been compounded by the fact that the government provides subsidies for cash crop cultivation but none for food crops. Hopefully, a System of Finger Millet (Ragi) Intensification help make this crop more productive. Mukherjee, Kuntal, Siddharth Gahoi, and Biswanath Sinha. 2014. Promotion of SRI - Millet: Reopening a closed chapter. International Journal of Agriculture Innovations and Research 3(3): 812-816. Pages 19-23 of the 2011 Livolink Foundation booklet Growing Crops with SRI Principles (note: very large file) contains some tips specifically for finger millet. (There is a good section on managing pests and diseases as well). Video: 2009 (December 25). Guli Ragi. 7:32 min. Produced by Digital Green. Digitalgreenorg channel, YouTube. Based on its success with SRI method for rice, Pragati began promoting the System of Ragi Intensification in 2011 in Koraput district, Odisha. After successes in 2012, the NGO organised a 5th District-Level Symposium on SRI in 2013 with an objective of highlighting the System of Ragi Intensification. Four hundred SRI practitioner-farmers from different blocks of Koraput District participated in the event. 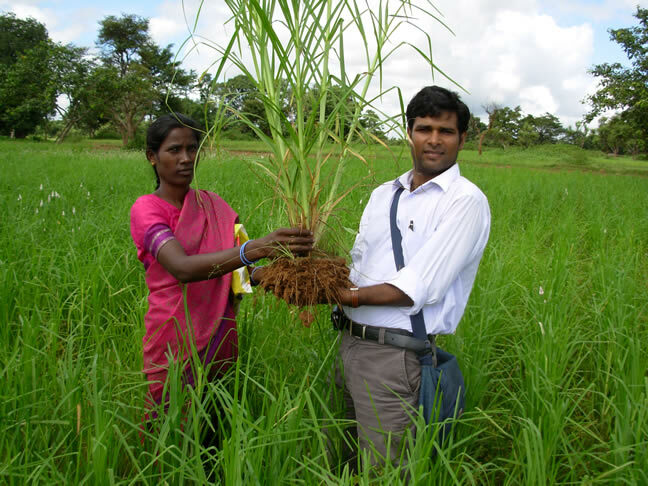 Basic Ragi Intensification practices promoted include transplanting seedlings of two-leaf stage (12-15 days old) with mass of soil attached to the root at a distance of 25cmx25cm (20cmx20cm in less fertile soil) in square pattern. The first weeding 20 days after transplanting is done with a roller weeder (right); the second weeding is done manually by hoeing. In the state of Karnataka, 95% of the cultivated dryland crop is finger millet. In Haveri district of Karnataka State, the NGO Green Foundation based in Bangalore several years ago found an indigenous farmer-devised system called Guli Vidhana for raising the yield of ragi. This methodology developed in the 1980s echoed SRI practice in many respects. The poster that Green Foundation developed to popularize this methodology made explicit the connection to SRI. Guli Vidhana methods are raising ragi yields beyond the previous maximum for the area, 1.5 t/ha, to 1.8-2.0 t/ha and even up to 2.5 t/ha in a good year. A 2011 PowerPoint presentation by C.S.P. 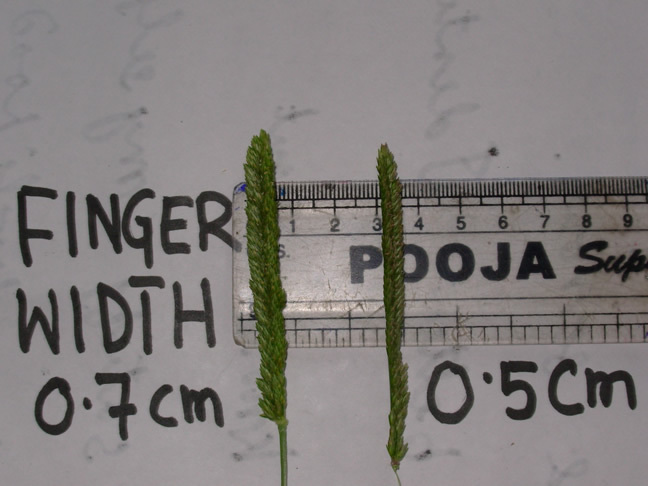 Patil provides updated information on this System of Finger Millet Intensification in Karnataka. In Haveri district of Karnataka State, the NGO Green Foundation based in Bangalore several years ago found an indigenous farmer-devised system called Guli Ragi for raising the yield of ragi. This methodology developed in the 1980s echoed SRI practice in many respects. The poster that Green Foundation developed to popularize this methodology made explicit the connection to SRI. Guli Vidhana methods are raising ragi yields beyond the previous maximum for the area, 1.5 t/ha, to 1.8-2.0 t/ha and even up to 2.5 t/ha in a good year. The system, described in a 2006 trip report by Norman Uphoff, involves two very interesting ox-drawn implements that farmers had adapted to their purposes . The korudu (left) is pulled across the field several times between 15 and 45 days after transplanting, to bend over the young plants without breaking them off, causing the mildly traumatized plants to put out more tillers and more roots. The yade kunte (right) is a blade mounted on the end of a long handle pulled down the wide space (45 cm) between rows and between plants, aerating the soil at the same time that it eliminates weed competition. In eastern India, the NGO PRADAN worked with farmers in Jharkhand state on adapting SRI practice to finger millet (left), in what they have called SFMI, the System of Finger Millet Intensification. These alternative methods can produce much more robust and productive phenotypes. The contrast in phenotypes was seen in the picture that illustrated the introduction of SRI concepts and practices for other crops (see photo at right). 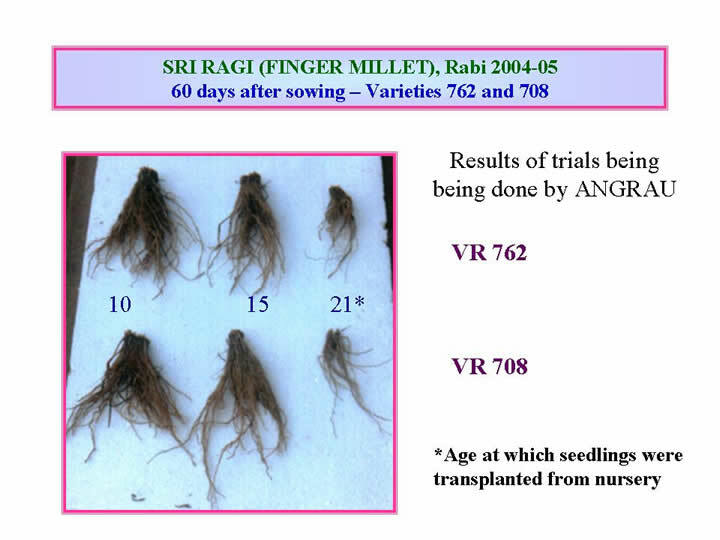 On the right is shown a representative local-variety ragi plant grown with conventional methods; in the center, an improved-variety ragi plant (A404) grown with conventional methods; and on the left, a ragi plant of the same improved variety but grown with what PRADAN staff have labeled ‘SFMI’ methods -- System of Finger Millet Intensification - perhaps to avoid the confusion of having a second ‘SRI.’ An SFMI manual, now available on the SRI-Rice website, is based on the experiences of farmers affiliated with the PRADAN rural development program in Chhattisgarh and Jharkhand States and with the SRI Consortium, Chhattisgarh, India. 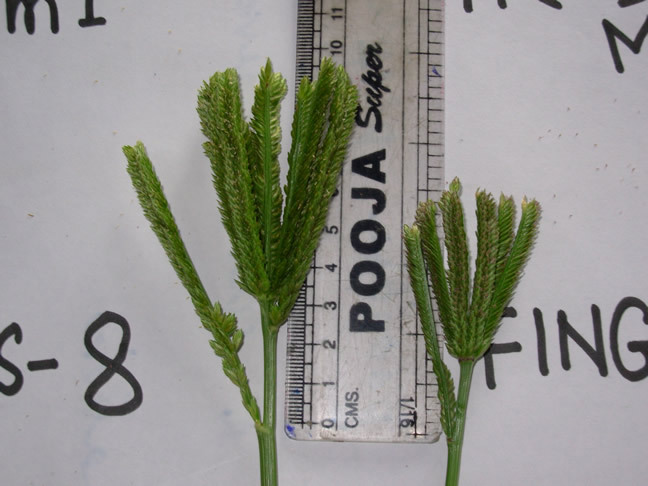 PRADAN staff also provided pictures showing phenotypic differences in the length of panicles (shown far right), in the width of panicles (near right), and most important for understanding why these differences occur, in the roots of SFMI vs. conventionally-grown ragi (left). 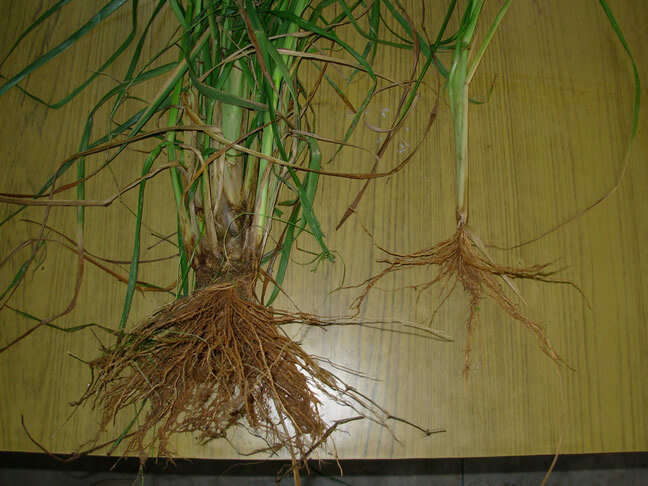 Researchers at the state agricultural university (ANGRAU) did trials in 2004-05 with two improved varieties of ragi (762 and 708), comparing the plants’ root growth after transplanting. They were interested whether ragi would show the same young-seedling effect that is seen with rice plants when managed according to SRI recommendations. Ragi seedlings were transplanted at 10 days, 15 days, or 21 days after germination. At 60 days after transplanting the plants showed the same positive response to transplanting at an earlier age as do rice plants with SRI management. Ragi plants transplanted at 10 or 15 days of age had much more prolific root growth than do those plants transplanted even 6-11 days later. (Click on photo at right to enlarge). A December 2017 article noted that by adopting SRI ragi cultivation and integrating it with ‘guli’ (plank) method, tribal farmers have successfully increased yield of ragi in 1,500 acres of four districts. Average yields of three to four quintals increased from eight to 20 quintals. Line-sowing instead of broadcasting, using only 500 gm of seed instead of 3 kg, transplanting young seedlings, using wooden plank or ‘cycle’ method for weeding and using liquid and solid ‘jeevamrutam’ (bio-fertilizer) are among the novel and cost-saving methods used as labour cost can be saved, according to A. Ravindra, director of the NGO WASSAN. Farmers (N=340) working with the People’s Science Institute based in Dehradun in the 2009 season, a drought year, tried SRI-like methods with small plots of finger millet to assess their viability. They transplanted single young seedling at 20x20 cm spacing, adding homemade biofertilizers to the soil along with compost. The number of panicles (ears) per plant was increased to 5, compared with 3 on the control plots, with 428 grains per panicle instead of 290 grains. The yield was 50% higher, 1.8 t/ha instead of 1.2 t/ha. A greater yield increase was thought likely in a season with more normal rainfall. ISD director Sue Edwards reports that previously, one elderly woman farmer who had intuitively combined a number of new practices that resembled SRI methodology achieved a finger yield of 7.5 t/ha, quite unheard of anywhere. She had raised the plants singly and wide apart, with well-drained, aerated soil. So good SCI results are not surprising to ISD or some of the farmers with whom it has been working for over a decade in Tigray province. 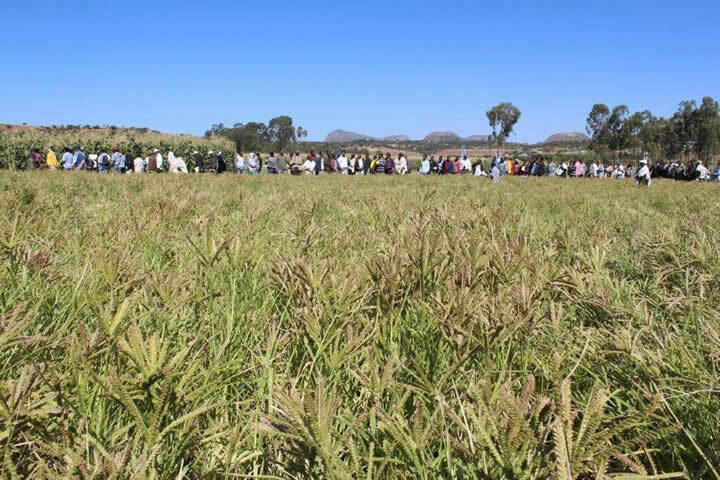 Oxfam America is assisting ISD and Tigrayan farmers to adapt SRI concepts and methods to rainfed cereal production in this very dry and constrained environment. More reports will be posted as results and evaluations become available. One of the three farmers reported on above who tried SRI methods with sorghum got a yield of 4.44 t/ha, encouraging other farmers to try this adaptation as well. We anticipate that sorghum as well as pearl millet, as graminaceous plants, should also respond positively to SRI-like management as finger millet does.